The award-winning CSA Journal is the leading professional publication in the senior market that focuses on emerging trends and issues in aging and the health, social and financial interests and needs of seniors. • The newest insights, strategies and tips to help you serve your senior clients even more effectively. • A Case in Point section with a senior client handout and an option to earn 5 CSA CE credits. • Tons of resources including handouts, articles and webinars that you can pass along to your senior clients and colleagues. Who's Going to Take Care of Me? Our Impending LTC Labor Crisis, by Lisa Rill Ph.D.
Family Caregivers: The Missing Link, by Amy D'Aprix, Ph.D. Long-Term Care: Do Your Clients' Beliefs Put Them at Risk?, by Marlene S. Stum, Ph.D.
You will find interesting, informative and educational articles in the CSA Journal - written by experts to help CSAs provide the highest value to their senior clients and to contribute to CSAs’ ongoing continuing education. 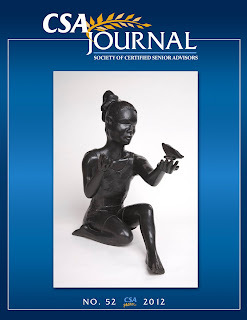 The CSA Journal articles show a real world understanding and respect for aging-related issues that seniors face and help you open lines of communication with seniors. You will find numerous suggestions throughout the articles on ways to support your senior clients when they make important decisions, as well as benefit and protect seniors' best interests. Through the CSA Journal, CSAs gain a bigger picture of social and scientific breakthroughs that affect seniors and are able to keep pace with new understandings about aging and issues that are important to the majority of seniors. If you have comments or suggestions for articles or ideas for tailoring the CSA Journal, please email them to JournalEditor@csa.us.